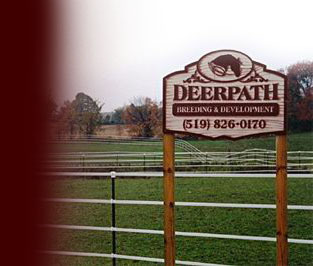 Located on 55 acres of rolling hills in Puslinch, Ontario, Deerpath Breeding & Development offers a consultative Stallion Management and Foal Development facility, as well as providing services to breeders. Deerpath is owned and operated by Equine Reproduction Specialist, Robert Fera. Rob has many years of experience in preparing young stallions for their breeding careers. Rob with his experience and education in breeding management and animal health provides a safe and professional equine reproduction facility, which many veterinarians refer clients to and rely on for experienced stallion management. Rob is a member in the American Association of Equine Veterinary Technicians and Assistants.